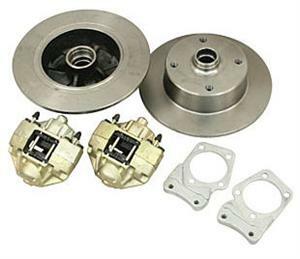 Super Beetle Disc Brake kits come with Calipers, Rotors, Mounting Brackets and Hardware. They are available with 4/130 VW, 5/130 Porsche, 5 on 4 3/4 Chevy and Blank Rotors. Does not work with 14" wheels. Click Product Options to choose yours.